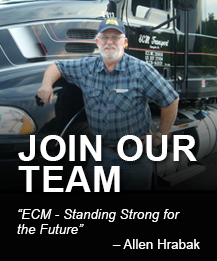 ECM TRANSPORT understands that your needs have no boundaries. Backed by our asset based division, ECM provides Truckload (TL) solutions throughout North America truly customized to your needs. Specializing in expedited and JIT deliveries, our priority is to offer piece of mind to our customers and yours, regardless of where the final destination may be. With our industry low claims ratio of 0.1% and annual on-time service performance exceeding 98%, contact ECM Logistics to customize a solution that best fits your supply chain.